Sarah: Next week I will be sharing the ScienceforLife.365 love at the Australian Science Communicators conference in Brisbane, Australia. I’ve put together a paper and a 10-minute presentation which describes this blog, and summarises some of the career benefits I believe it has delivered me (in addition – of course – to the personal enjoyment I have derived from the project). You can read my presentation summary here. Hopefully the paper will be available for public viewing after the event as well; I’ll post a link if possible. I’m also delighted to be co-producing the What is science journalism? session with journalist and author Bianca Nogrady. The subject matter arose following several posts on this blog, as well as discussions we had with a broader audience through the email network of the Australian Science Communicators. We are very fortunate that fabulous radio host Natasha Mitchell will be chairing the session, and supported by an expert sciencey journalistic panel consisting of Jenni Metcalf, Leigh Dayton, Graham Readfearn and Ian Townsend. 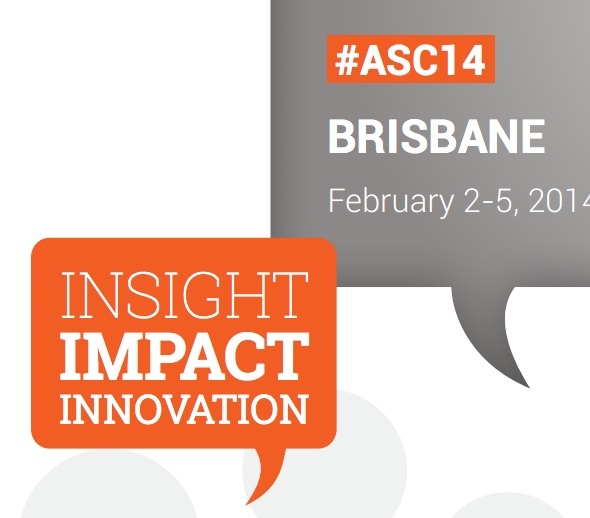 Stay tuned to @sciencesarah and #ASC14 for coverage if you’re interested. But wait, there’s more! I’m thrilled to be a co-presenter on a further two presentations at the conference: one on the RealScientists project, and the second around the science twitter chat #onsci. But the best, best, best part of the conference will be meeting up with people with whom I chat regularly online. Like Kirsti Abbott! Yes, Kirsti who blogs here. Hard to believe, but we have only ever met before on twitter, Facebook, Skype and email. Gin and tonics and lots of laughs will be happening for sure. In the name of science. Kirsti: Me compiling a post about heating my body up after some mighty heatwaves across Australia might seem somewhat of a surprise. You may even wonder whether I may be lacking thermoregulatory capacities. Well, it’s true. I do lack them. I have pretty low blood pressure and to say my extremities get cold easily is the understatement of the year. So mid-summer, post-heatwave, I bought some heat packs (yes, I realise this is a dodgy internet site). As you do. 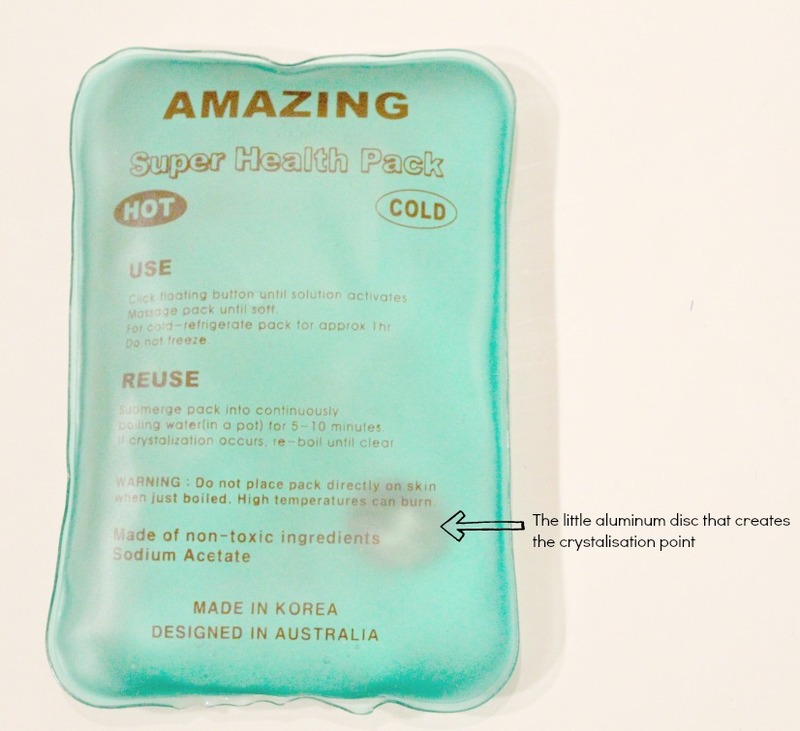 In fact I bought a pack of those reusable awesome sodium acetate or ‘hot ice’ packs. I love the fact that there is a chemical reaction I can WATCH as my heat pack prepares itself to warm my tootsies in bed. Who doesn’t want some chemistry before bed!?! This heat pack is a nice demonstration of how a super saturated solution behaves essentially under every day conditions, but having been treated with some interesting processes before I got my hands on it. To be honest, initially I struggled with understanding exactly HOW this thing works. Now, I think I’ve worked it out…..with some help [thanks Chris Thompson!]. Inside my little pack is sodium acetate in a supersaturated solution. That is, the sodium acetate has been heated to some temperature at which you can dissolve much more of it than if it was at room temperature; kinda like how you can dissolve more sugar in hot water than you can in cold water. Then if you cool it gently, it will stay saturated, and stay in a liquid state. So sitting pretty with way more molecules of itself than it knows what to do with, when I click a little concave steel disc inside the pack, it creates friction – a fairly violent event – in the solution. This then becomes a nucleating site for crystallisation to occur. Crystals grow outward from the disc, and because it is an exothermic reaction, as it becomes a solid and appears as ‘ice’ crystals, it heats to around 54-57oC. The heat will eventually dissipate and then I can melt the crystals back into their solution to once again anticipate warming my tootsies tomorrow night. Thank you sodium acetate for also heating my feet when I’m camping without me waiting for the billy to boil…..
Kirsti: Having endured the past week, you might not be surprised to know that this time last year was also hot. 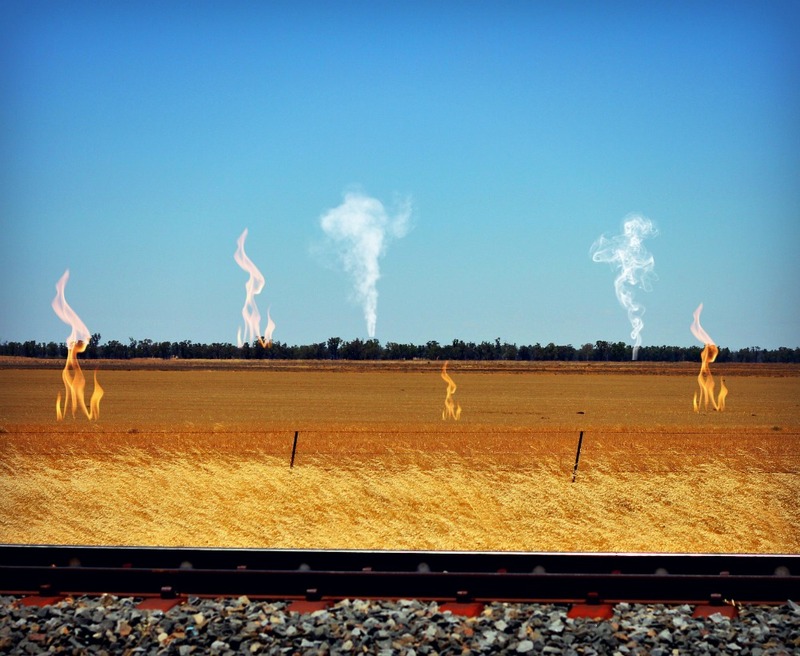 It reached almost 50oC in Moomba, South Australia in January 2013, and in Narrabri NSW – where we were driving a fortnight ago – it reached almost 48oC. In fact, have a browse of the daily extreme temperatures during January yourself – WA and QLD peeps are cooking eggs on car bonnets every day! But this is not a post about climate change, even though it is contributing to these hot summers. It is about localised heatwaves, which are heralded if the temperature has been extreme for 3 days in a row; ‘extreme’ is relative to the time of year. You can check if there has been a heatwave in your area on an amazing website called Scorcher too, but it doesn’t tell you why it has occurred. The thing is, heatwaves are caused by a complex combination of long- and short-term factors. Uber-long-term factors include global warming, both natural and man-made. Australia has warmed steadily since the 1940’s. But medium- to short-term factors are what interest me most at the moment. Warm winters preceding summer can increase temperatures across the continent, and high pressure systems (characterised by clear dry days) are also responsible for the local warming of air. Dry soils do not absorb heat as effectively as those holding water, which can act to heat the localised above ground air. But probably the most important is the fact that it is warmer more often and for longer periods of time. Recent heatwaves in Australia are essentially an extension of the preceding record breaking hot days, even months, exacerbated because it is mid-summer. I would advise at this point to check the forecast and consider the previous month’s temperatures before embarking on a roadtrip into western NSW and southward. Our two kids, trailer and 1996 Nissan Patrol can attest to it being one hot and sweaty trip spotting willy-willies, wheat and windmills! NB: Image is a digital alteration of one of my own photos. Sarah: After approximately ten years of summers and Easters and long weekends spent at the southern end of Yorke Peninsula, I am now finally the happiest amateur naturalist alive. With my trusty A Guide to Squid, Cuttlefish and Octopuses of Australasia (thanks to redmap), I can finally identify the two species of cuttlefish ‘bones’ (actually internal shells used to aid buoyancy) that wash up on ‘our beach’ at Marion Bay. The bone shown above – collected on the beach this afternoon, and photographed on my coffee table – are approximately 10 cms long. On the right is the bone from a Giant Australian Cuttlefish (Sepia apama), famous for its incredible colour and textural displays and mating aggregations in the waters of South Australia (although recent data suggest numbers are declining). 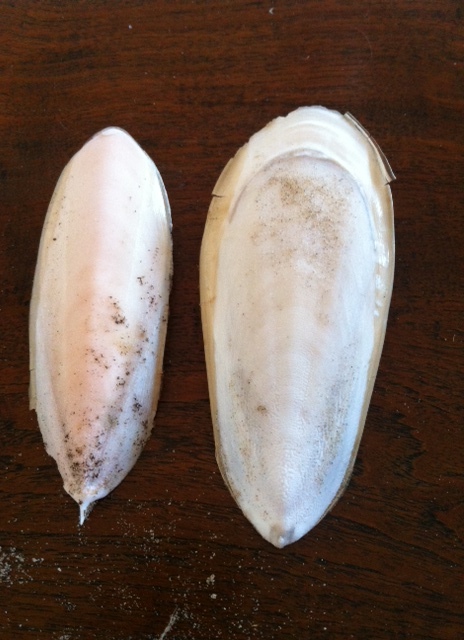 The bone on the left belongs to the Knifebone Cuttlefish (Sepia cultrata), a less common and deeper water species found in waters stretching from Queensland to Western Australia. No longer will I wander the beaches in ignorance of these chalky cuttle remnants discarded on the high tide line. Now I can sleep at night.